Gresley Church | … A Church at the heart of the Community seeking to be: Rooted in Scripture, Relational, & Abundantly Generous. Welcome to the website of St George and St Mary’s in Church Gresley, Swadlincote! In December 2017 Gresley Church was forced to close St George’s and St Mary’s building due to falling masonry. This came as a great shock to many and we spent sometime working through this painful event. However, through prayer and prophecy it became clear to us that the Lord was sending us out in order to be different and serve Him differently. 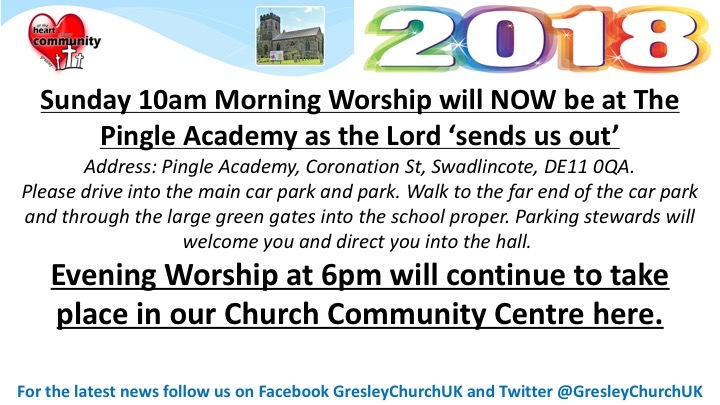 The Lord went before us and prepared the way for us at Pingle Academy where we now worship each Sunday morning. As we learn to lean more upon the Lord we have looked to the future and how we will spend the next few years as a people who have been ‘sent out’. First we will reach out across the greater Swadlincote area to transform social issues (social mobility). Our Heritage Lottery Grant will act as the vehicle that drives this. Second we will create opportunities for our people to grow and flourish in lay leadership and ministry as we share the Gospel with any who have not yet received it. Through the Minster Model we are becoming part of we will, as a catalyst for this, set up Missional Communities to develop disciples – old and new. Rooted in Scripture, Relational, & Abundantly Generous.